I was born and brought up in Nellore and got my Bachelor degree in fine arts from JNTU, Hyderabad. I opted not to pursue my post-graduation though I got admission in to IIT Delhi for the Master in Designing course. However, I ventured into software and web designing to earn my daily bread. I joined 'Just Yellow' and worked there as an in-house art director for the Amrutam TV serial by Just Yellow. I made my debut as film art director with Aithe film. Since then I worked for films Morning Raga, Anukokunda Oka Roju, Chatrapati, Vikramarkudu, Amma Cheppindi, Rakhi and Okkadunnadu. I got a chance to work with Rajiv Menon for the Morning Raga. Later on I worked for some of his commercial advertisements. My next project is the one that is going to be directed by Krishna Vamsi. What is art direction all about? Many assume that the work of an art director ends just with erecting sets. But art director is very much responsible for creating a mood and setting an ambience for the scenes/story of the film. Art director should also take responsibility in erecting sets, scouting locations, working with costume designer and he should also consider the role of sound. How do you design sets? When we want to make a set, we first look out for any sets that were already available in the studios. If we find any, then we modify them according to our specifications. Otherwise, we have to erect sets right from the scratch. What is the material that is used for set making? We use different materials like plywood, plaster of Paris, fiber, sponge, softwood, deal wood, soft foam, paper etc. 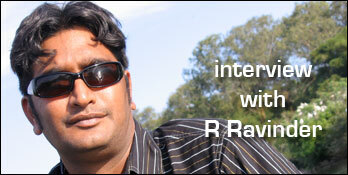 How did you design weapons, especially for Rajamouli's action films like Chatrapati and Vikramarkudu? We use very soft material for weapons to ensure that the fighters and actors don't get hurt. All the weapons designed look very rugged and lethal, but the soft material will make sure that it will not hurt the people. We also consider the surroundings in that particular scene while making weapons. If you look at Vikramarkudu weapon, Rajamouli has created an ambience where some welding work is going on. He shown it like hero has taken that weapon from the welding place. Who inspires you as an art director? I like Thota Tharani, Sabu Cyril and Ashok. I got inspired by looking at the artwork in Mani Ratnam's films. Gangaraju Gunnam, Chandra Sekhar Yeleti and SS Rajamouli helped me lot in learning the tricks of the trade. Krishna Vamsi also encouraged me. Which is the most challenging work you have done so far? Rocket designing for Amma Cheppindi is the most challenging work. What do you think is your strength as an art director? Realistic sets. There are many instances where even the most experienced directors and filmmakers could not make out the sets, I have designed. I designed a baddi kottu in Aithe film and people started approaching the small shop asking for cigarettes thinking it was real. Chandra Sekhar Yeleti could not realize where the set is in Rakhi film. I feel that sets should not dominate and should not distract the attention of audiences. Sets should help to elevate the mood of the film. By making sets look realistic and natural, an art director can help director narrate the film in a more smooth way. What is the budget for artwork in your films? The budget for art work was 70 lakhs, 50 lakhs and 25 lakhs for Chatrapati, Vikramarkudu and Amma Cheppindi respectively. What is your future objective? I want to be known as a good technician. I want to do sets for period films.